KMI Brands are thrilled to announce that 97% natural haircare brand Noughty have secured their second Naturally Curly award for a consecutive year, winning the Best of the Best Leaders in Curl award. 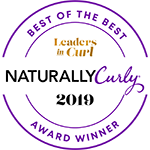 In 2019, for the first time, Naturally Curly created the Best of the Best Leaders in Curl Awards program to recognise those products deemed the best textured-hair solutions, with winners selected by both the community and their editors. Noughty’s Wave Hello Curl Defining Shampoo received the Editor’s Choice: Best Shampoo award. This follows on from the success of last year where Noughty’s 1 Hit Wonder Co Wash won the Naturally Curly Editor’s Choice Award for Best Conditioning Cleanser for Type 2 Wavy Hair. The largest brand-agnostic authority on textured hair, health and wellness for close to two decades, Naturally Curly reaches 16 million consumers, inspiring textured hair women to stand tall, feel tall and be beautiful.